The Soundtrack to Your Life. No email needed. No login required. Just press play and go. Do you tend to like Icelandic Metal on sunny days, but have a thing for Indie Rock when it rains? Maybe you even dig Classic Rock on humid afternoons? WeatherTunes Music is deeply connected to the rhythm of your day. It speeds up your tunes when daylight is bright and slows it down once sun begins to set. WeatherTunes Music will fine-tune to your likes, will adjust to the weather around you, and can even display in your favorite color! 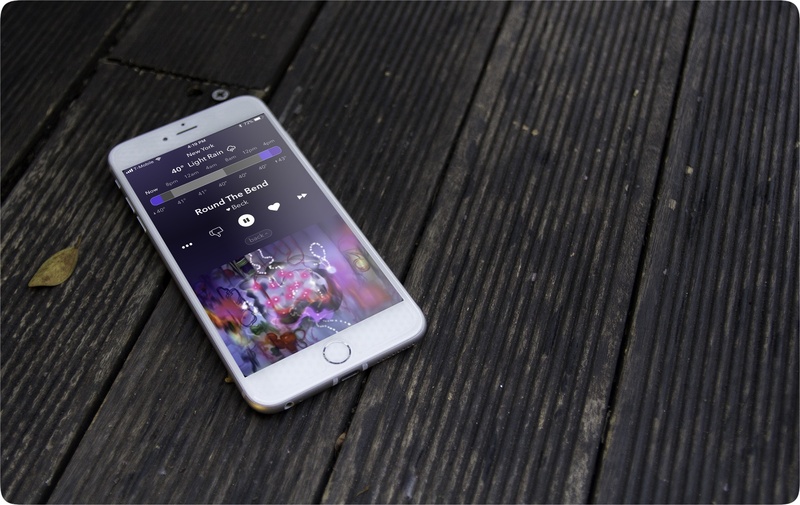 The app is all about you and will introduce you to new music while skipping the songs you dislike from the playlist. Perfect for lounging around the house or doing work. No thinking, just hit play. 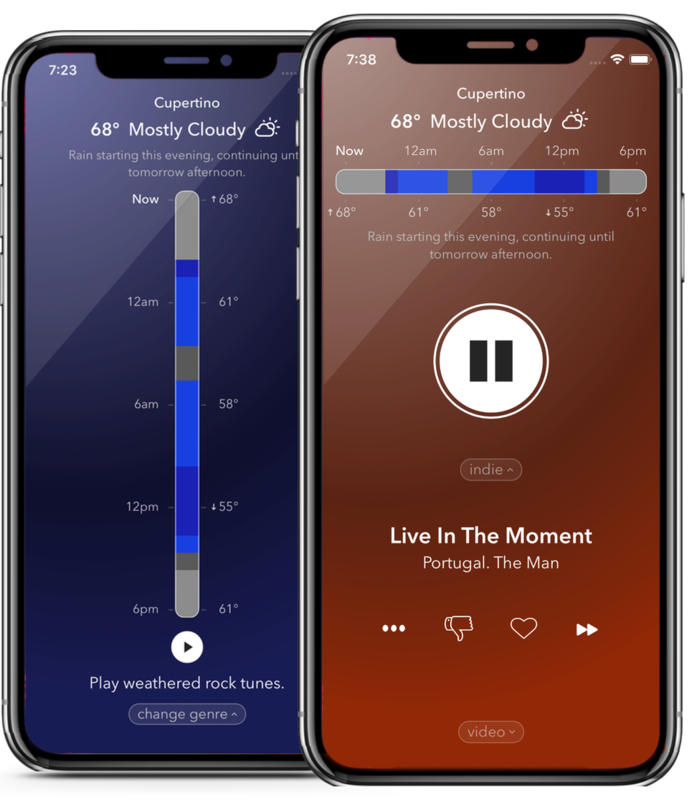 WeatherTunes Music is a forecasting app that plays the right tunes for the your specific weather, using the highly accurate dark sky service. It works behind the scenes using your surrounding conditions, and other various factors, such as time of day, wind speed & UV index to pick songs that will fit that moment in time. To get even more enjoyable mood fitting music, you can like/dislike both songs and artists making the stations you choose hyper personal. And now with the Smart Station, new in v2, it gets even more personal. It learns your tastes using the weather as a factor, and plays only what you like! At a glance information on the weather using the colors on the weather bar. White is clear skies, the darker the grey, the cloudier it is, and the deeper the blue, the rainer it is. Down to the hour detailed information on precipitation, wind speed and humidity, when you swipe your finger over the weather bar. Choose from eleven genres, or just hit play and go by choosing the 'Smart Station'. Swipe up and watch the video. Choose your own color theme. WeatherTunes uses the the best quality video provided when on wifi, the best being 720 bitrate. When on a data connection it defaults to 360, but switches to 240 if the connection is slow. 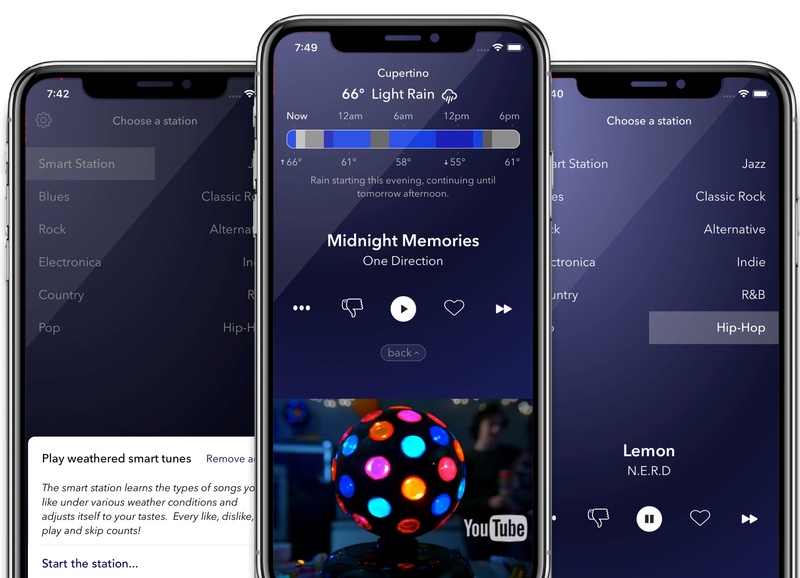 * WeatherTunes does not cache any songs, and is at its best when using a wifi connection or a strong data signal. © weathertunes, all rights reserved.